It’s a well noted irony that while a fashion show is over in a matter of minutes, the creative endeavour behind it is a painstaking process of research, experimentation and refinement, that lasts a matter of months. 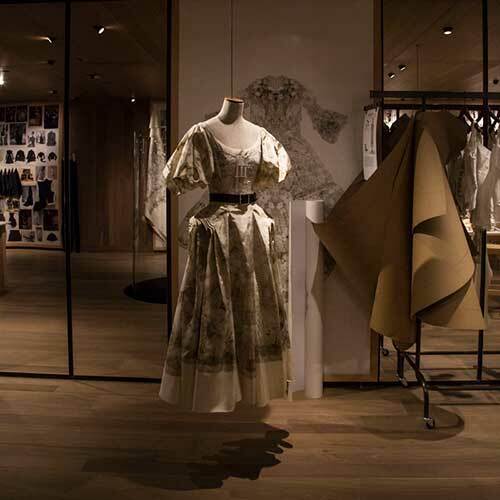 Now, in celebration of the behind-the-scenes activities that contribute to a final runway collection, Alexander McQueen has launched ‘Unlocking Stories’, an exhibition on the top floor of its newly opened Old Bond Street flagship in London, showcasing the tales, teamwork and materials behind its S/S 2019 collection. The British label enlisted Chilean architect Smiljan Radic, the mastermind behind the translucent shell-like 2014 Serpentine Pavilion, to design its latest Mayfair space. Natural forms – also idiosyncratic of the brand – feature in the boutique which is swathed in wood, oak and walnut, and boasts curving lines, echoing the contours of the body, or the lineation of the natural landscape. ‘Unlocking Stories’ can be found after climbing a series of enclosed spiral staircases, almost like ascending through a smoothed hollow of a tree. The floor is also populated with distinct glass cylinders which offer glimpses into the floor below. The boutique’s top level is a treasure trove of toiles, mood boards, fabric swatches, books and photographs, which all echo the extensive studio process needed to design an emotive, narrative-laden and masterfully designed Alexander McQueen collection. Be it the paganism-inspired and empowering S/S 2019 women’s offering, or a menswear ode to artist Francis Bacon and the photographer John Deakin.